Everyone has different reasons why they journal. There are a multitude of types of journals to be kept, and many people keep specific ones for different aspects of their life. From travel journals, to dream journals, to prayer journals, you can write yours about anything. It doesn’t even need to be about anything specific, just simply getting your thoughts down on paper is a great habit. There are many benefits of keeping a journal, but journaling is especially helpful when used as an outlet to create, experiment and manage various parts of your life. It gives you a place to practice writing techniques, flesh out ideas, as well as just keeping a record of times you never want to forget or things you need to remember. If you have ever wanted to practice or improve your writing, the best thing to do is write. You don’t have to have the perfect topic or a specific theme, you just need to start getting your ideas on paper. The more you work through them, the more those ideas will flourish into something more complete. Everyone is creative. If you don’t think you are, then maybe you haven’t tried. Your journal is a place to write down anything that comes to mind. The crazier the idea, the better. Let your imagination wander to the farthest parts of your mind and record the journey. The more you practice experimenting with possibilities and opportunities, the more inspiration you will find. Keeping a diary is a great way to help your creativity flourish. The benefits of journal writing are that you are able to keep all of your ideas in one place, no matter how all over the place they may be. Feel free to jot down whatever pops into your head and let your mind wander. Later on, you can come back to these ideas and look for connections and conclusions that may promote even more new and awesome ideas. Diaries help keep your thoughts organized and comprehensible. You can record daily musings, the feelings you had about a certain experience or the opinions you had about a specific event. 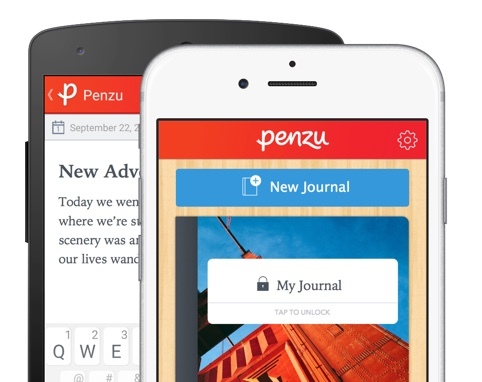 Penzu allows you to tag and archive your entries, so whatever you have written can be found in an instant. They can become memory banks of whatever you wish or reminders of anything you want. By creating diaries that are specific to certain topics, you can organize and archive your thoughts even more. Journals can take you back to that year you spent backpacking, they can remind you of a business you wanted to start or they can guide you to a happier state of mind. Whatever you decide to write about, writing in a diary helps you sift through the clutter in your mind by organizing your thoughts into notes, lists, memories, stories and more. Writing down your feelings acts as a release and can be very cleansing. If you are able to put your anxieties, frustrations and pains on paper, then you are less likely to harbor them inside, which creates stress. Expressing yourself in a diary is a positive way to free tension you may be internalizing. To quote Ferris Bueller, “Life moves pretty fast. If you don't stop and look around once in a while, you could miss it.” Our lives can become very hectic, making it easy to get caught up in the day-to-day. Responsibilities and expectations start to consume us. Journaling is a way to take a step back from all of that and reflect on yourself. You may begin to see patterns in your behavior, or in the behavior of others. The benefits of diary writing in are that you are able to look back at pages you’ve written and think about how you’ve changed, discover things you want to change or decide on things you need to change. It is time to get those creative juices flowing, those ideas rolling and that brain of yours growing. But remember, the reasons of writing a journal do not stop here. Discover more by starting your journal today!